I have been searching high and low for a tomato sauce that doesn’t come with “natural favours” or salt and almost impossible to buy it from store. Hence, I have decided to make some for my tots. They love pasta. This is an easy sauce to make, just a little time-consuming. I used the slow cooker instead so that I do not need to watch over the fire. After it is done, you just need to blend to get the texture. 1. Buy the ripe tomato, I have tried using the big red tomato and cherry tomato and find the latter gave a lighter and more refreshing tomato taste. If you prefer a sweeter tomato taste, use the big ripe ones. 2. Remove the seeds of the tomato before cooking as the seeds can cause bitterness. Similarly for the skin, which causes bitterness, you can either peel it before cooking or simply drain it out using the sieve after blending. Alternatively is to use canned tomato for convenience. Whatever tomato you are using, it will affect the colour of the sauce slightly. 3. 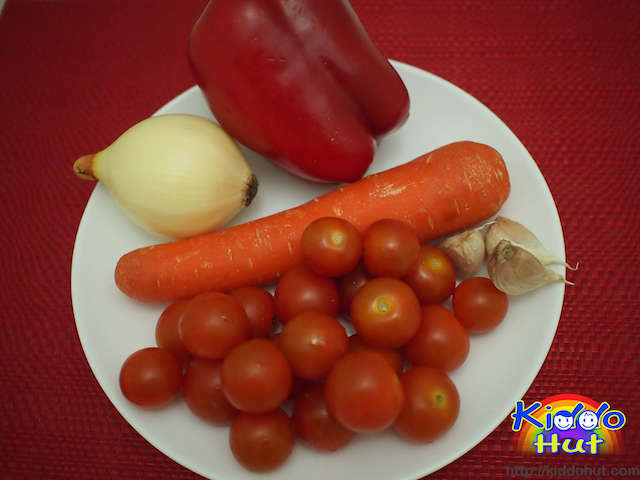 If you are making this tomato sauce for older toddlers, you may add basil leaves and bay leaf for fragrance. Some kids do not like the smell of spices so adjust to your kids’ preference. 4. Usually for thicker sauce, there is no need to add water. In my recipe, I added 100-150ml of boiled water (cool or hot) to expedite the cooking and breaking down of the ingredients. Also, I cooked it on stove before transferring to the slow cooker, to avoid burning the ingredients or ingredients sticking at the bottom of the pot while simmering, water is added. Else, you can omit or reduce the amount of water. Part of the water gets evaporated during simmering. 5. This tomato sauce does not taste like Ketchup as there is no vinegar, salt or sugar. 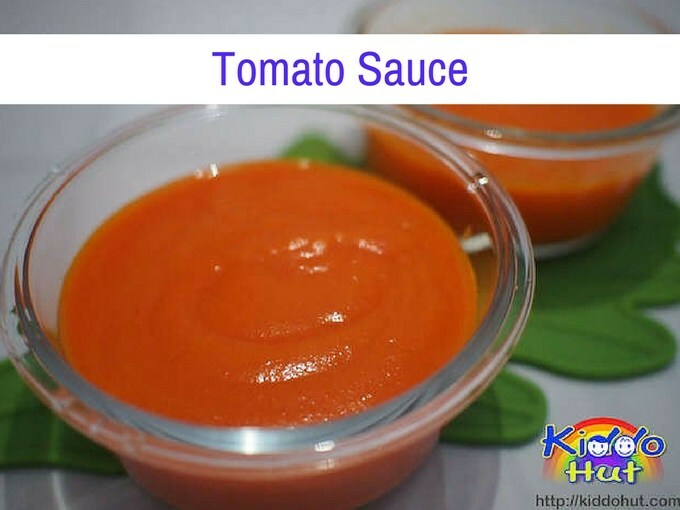 If you wish to “transform” the tomato sauce into Ketchup-like, you may add 1.5 teaspoon (7.5ml) of white/red rice vinegar, 1 teaspoon (5ml) of sugar and 1/4 teaspoon (1.25ml) of sea salt to 100 ml of sauce. You may adjust the quantities of the vinegar, sugar and salt to preference. All ready to cook some pasta or use as topping for pizza? 1. Heat oil in the pan under medium heat, sauté the garlic until fragrant. Add onion and sauté until onion turning translucent. Stir continuously. 2. 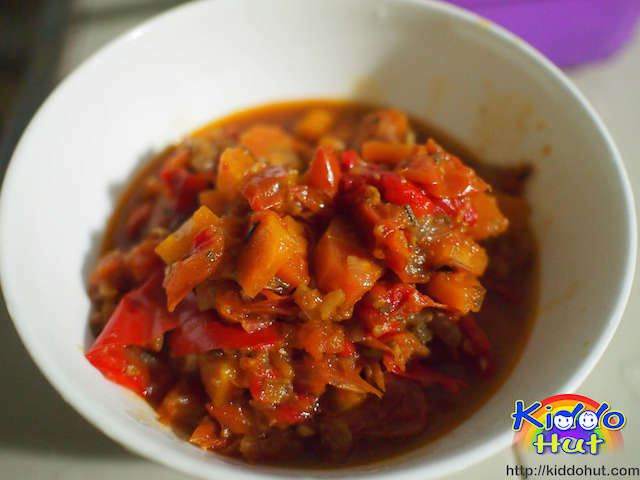 Add red pepper then carrot and continue to stir fry. 3. Add the tomato, basil leaves (optional), bay leaf (optional) and water. Then bring to boil. You may omit water if you prefer a thicker sauce. Adding some water will enable faster cooking and breaking down of the ingredients. 4. 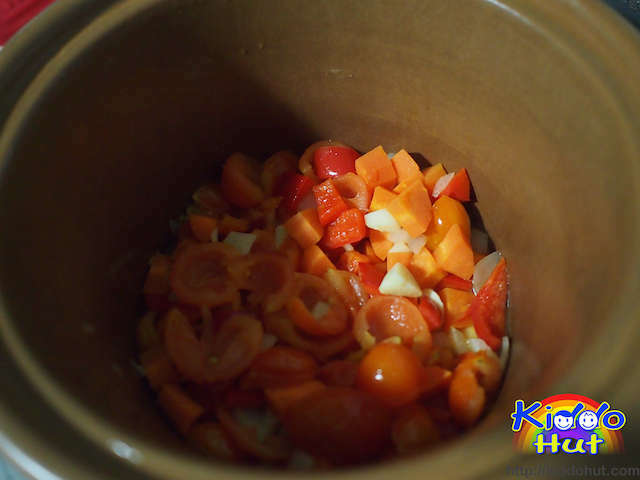 Transfer the pot to the slow cooker and simmer for 2 hours. Discard bay leaf before blending. 5. 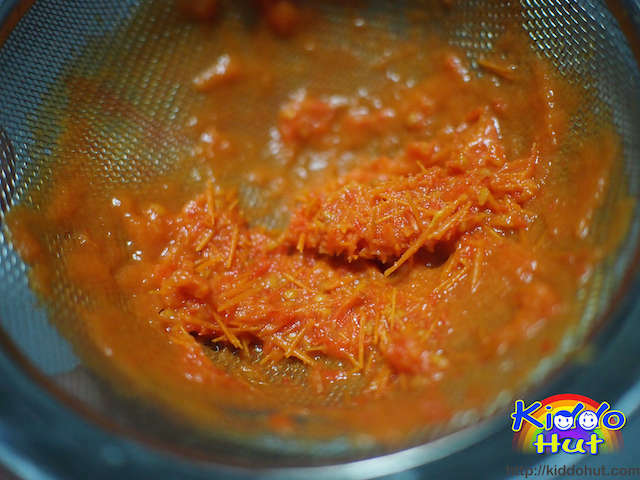 Blend till smooth, strain the tomato skin using the sieve. 6. Serve immediately or refrigerate or freeze for later use. You can keep few days in fridge and longer in freezer. 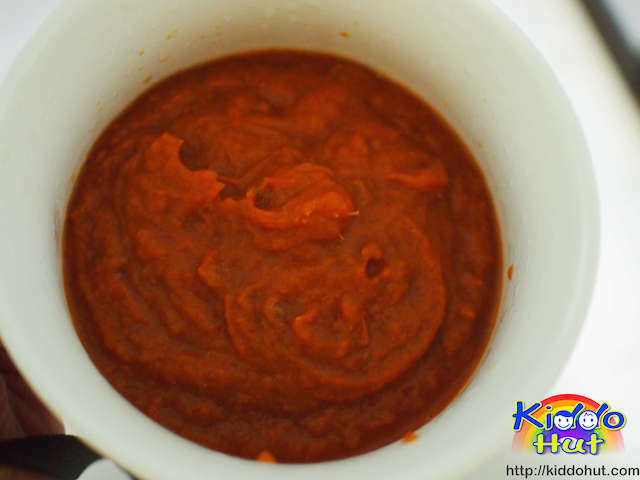 You may add 1.5 teaspoon (7.5ml) of white/red rice vinegar, 1 teaspoon (5ml) of sugar and 1/4 teaspoon (1.25ml) of sea salt to 100 ml of sauce to make it taste like tomato ketchup. 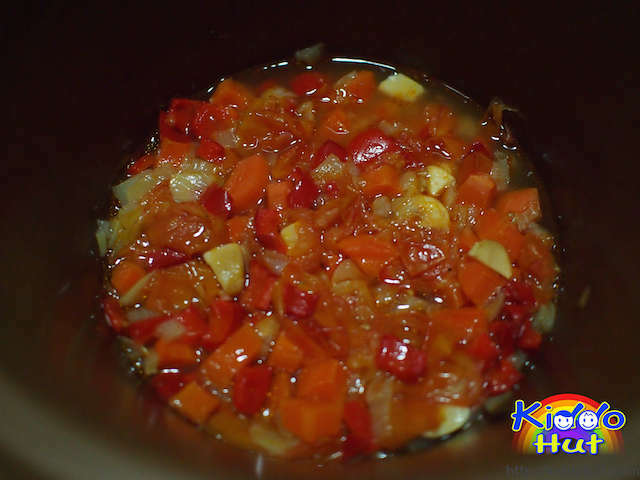 Heat up the sauce, add sugar and sea salt followed by vinegar to dissolve the sugar and salt. I make my own tomato sauce too but my daughter didn’t like it until one day I made it without onions. Now it’s the best tomato sauce ever! Yes, I cooked porridge, boiled soup in slow cooker when I didn’t have time to look over the fire. It doesn’t spoilt the taste.